In years past it took me until the week before or shamefully, even the week of Christmas to really get into it. Don’t get me wrong, I really do love Christmas but putting forth the effort to get ready was lacking. This year for some reason, it hit me to try a little harder. I’m not sure what it was. Maybe it was this list or maybe it was just the fact that I should really act like I am excited about celebrating Jesus’ birthday. At any rate, I started by buying some new Christmas music and began playing it during meal times. Nothing like music to get us all in the spirit. Best of all, most of those Amazon gave away for free! So for the outside, I put some lights on the house last week, BEFORE December! That never happens. On the inside, we are getting our tree tomorrow and will decorate the house all up then. Getting our tree three weeks before Christmas! That is some kind of record. I made one lickety split and wouldn’t you know, it actually works out pretty good. 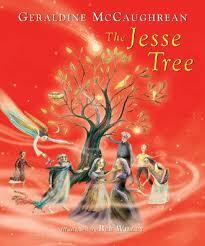 For the starting of the Advent season, we also bought a new book for the kids: The Jesse Tree by Geraldine McCaughrean and Bee Willey. So far, the kids really like it. And so do I. So how ’bout it, how do you get in the Christmas season?